Hey, look, something else I finished while I was photo-less. 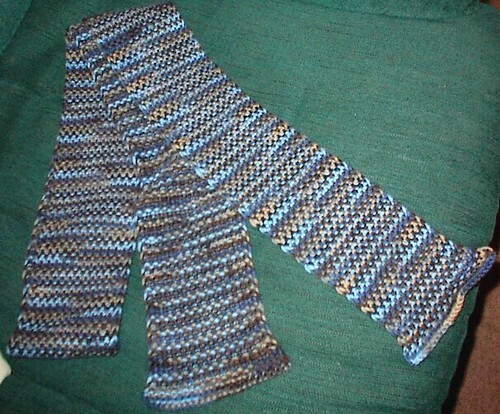 It's the Linen Stitch Scarf from the Pattern-a-Day calendar, a few months back. Patons Classic Wool in Wedgewood. It looks smashing with my new denim jacket. 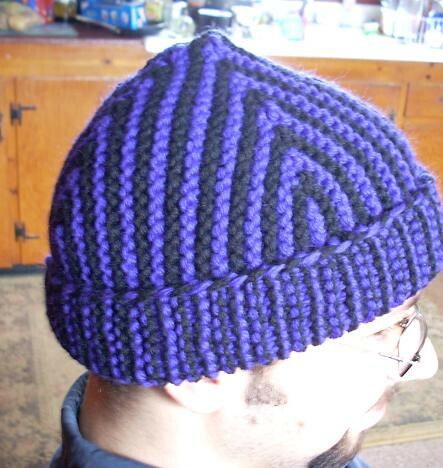 This pattern was fun, and I'll probably be doing more of them - I'd make the next a bit wider, though. As I mentioned a few days (weeks?) 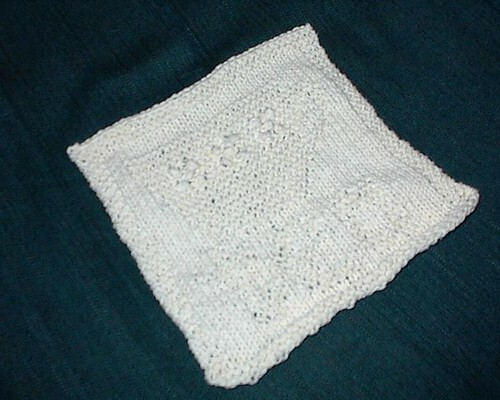 ago, I've been bitten by the dishcloth bug. 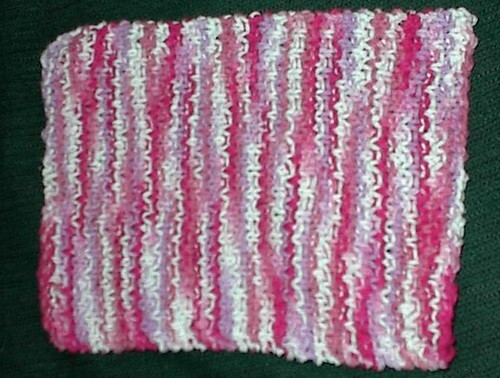 I think it's a combination of needing quick gratification while in the midst of a bunch of big projects and actually needing dishcloths. First: isn't it cute? It's even cuter in person. And it has wee Beatrix Potter buttons. And it's all soft and fuzzy and cozy and I love it. 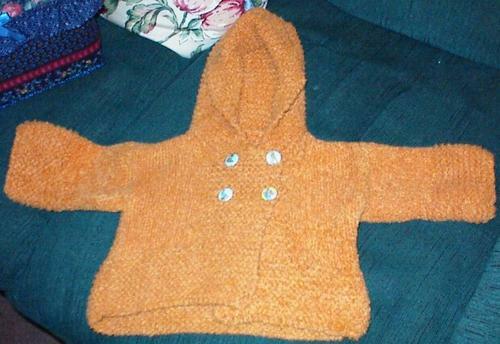 Second: oh my GOD was this awful to knit. If it hadn't been so cute, I probably would have given up. I'm having trouble imagining what could possibly induce me to use this yarn again. It split and pulled horribly, and I'm a bit worried about how the finished object will hold up. 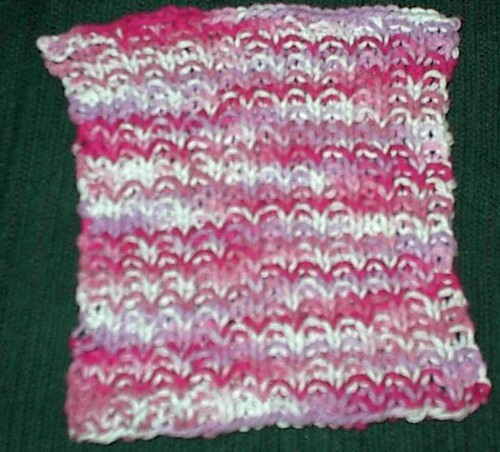 I do really like the pattern, though, so I will keep it and possibly try it with another yarn sometime. Look! 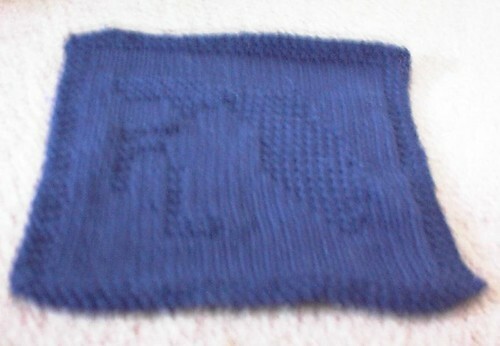 Proof (albeit small) that I still knit! I finished these last weekend and immediately gave them away. 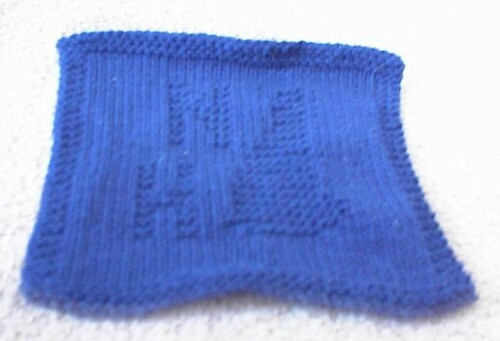 The pattern is the "Infant Socks" from this year's Knitting Pattern-a-Day calendar, January 12. 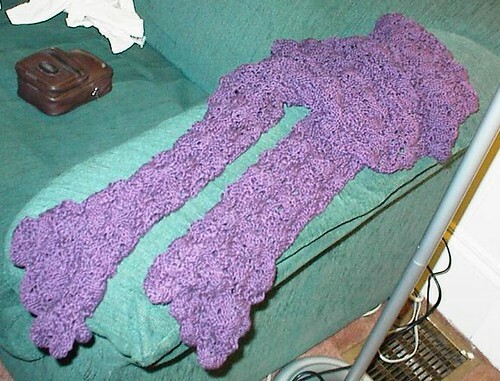 (I have no idea what the yarn is. 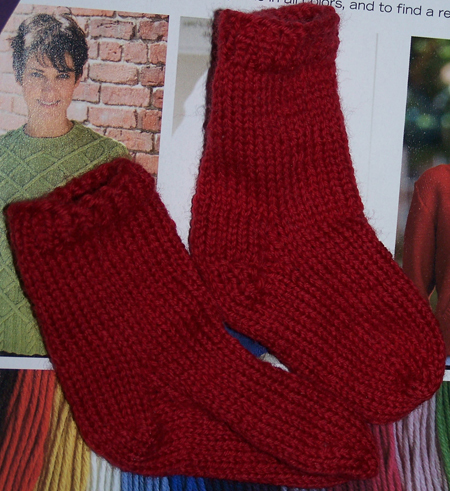 Some sort of red sock yarn.) 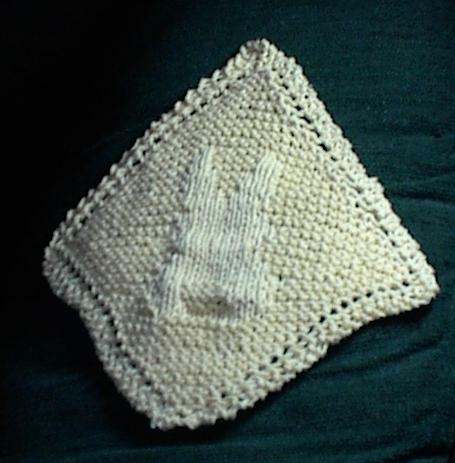 I really like this pattern - I like actual baby socks much better than baby booties in most cases. Finally, my first finish of 2007! 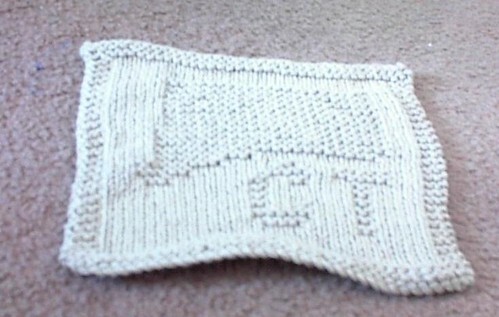 This was my UFO for January, and I actually finished it a few weeks ago, but somehow never managed to post it. I'm trying to clear up my backlog of "things I meant to post about, so here it is! 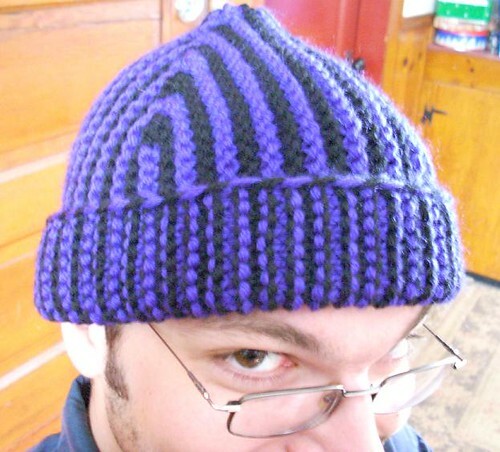 I would do the traditional yarn/pattern/etc. 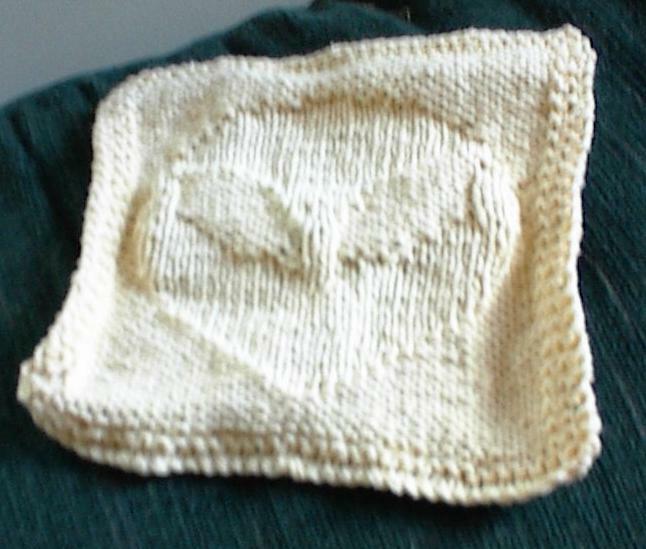 thing under the picture, but I made up the pattern as I went along, and I forget what the yarn was. 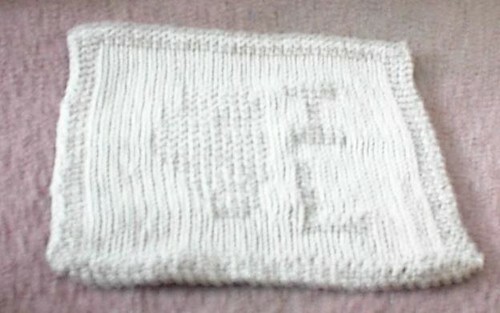 Some sort of worsted weight 100% cotton that I found at Building 19 a while back. (Yes, wearing pajamas! Blurry, because I had to take it with my off hand.) Of course, while I was taking that picture, he jumped on the table and started drinking my cocoa. Sigh. My "spirited" kitten. So. I think you'll forgive me and understand why I'm not taking pictures today of the bag of yarn I just got at the Superbowl Sale.